Dr. Kovalchuk is devoted to creating beautiful and healthy smiles for his patients in a professional and relaxed atmosphere. Utilizing the latest technology in his serene bay-view practice, Dr. Kovalchuk creates an individualized treatment plan to meet each patient’s needs. Services include a full range of general and cosmetic dentistry with an emphasis on effective one-appointment procedures. New patients are most welcome! Dr. Kovalchuk’s philosophy is centered on maintaining a relaxed and friendly doctor-patient relationship. Each patient’s particular needs and preferences are thoughtfully taken into account to create an effective treatment plan for life-long oral health. We provide wide range of dental procedures utilizing the most up-to-date technology. Our approach to prevention, diagnosis and treatment is based on on the latest scientific research. Please call us at 415.381.4321 to verify participation and coverage. 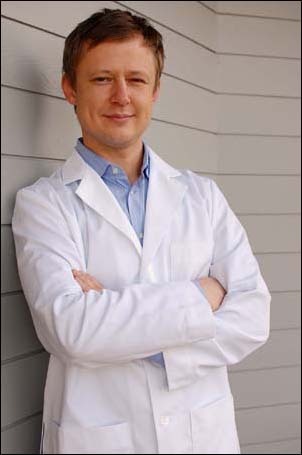 Originally from Ukraine, Dr. Kovalchuk received a degree from the National Medical University, Department of Dentristy in Kiev. In 1999 his desire to expand his personal and professional horizons led him to immigrate to the United States. Denys’s westward journey led him first to the East Coast cities of Boston and Philadelphia and then to beautiful California were he chose to further his dental studies. After graduating with honors from the University of the Pacific School of Dentistry in 2008, he practiced dentistry in Modesto, CA before starting his own practice in Mill Valley. Family, music, nature, good books, and meditation make him happy. Our office is conveniently located right off Highway 101 just minutes away from Golden Gate Bridge. Take the SECOND Seminary Drive Exit. This will put you directly facing our parking lot, which is next to the Ferrari and Maserati dealerships. Our complex has a blue roof and the correct entrance is the door underneath the "591" sign. EXIT Seminary Drive. At the light, turn RIGHT. Follow this road under the overpass putting you onto Redwood Highway. Our office is to your LEFT in the gray building 2000. Turn LEFT down the hallway as you enter the building. We are the first office to your RIGHT. "I just wanted to say that this was the most pleasant dentist appointment ever. . Very personal which is what I was looking for. . plus the work was great. . definitely going back. ."
"Dr. Kovalchuck is a good dentist who is very professional and able to diagnose dental issues quickly. He is able to explain what needs to be done and why. Very nice person and wonderful staff. The view from dental chair is amazing!" "Dr. Denys Kovalchuk is a friendly smiling professional who takes the time to do his work right. I have visited him three times for preventative care as well as restorative. I am well pleased." "Excellent service: attention to detail, gentleness, my comfort level, price and attitude. "Excellent results, excellent service, skilled dentist!" "Again, another great experience! The level of care, skill and expertise is mind-blowing. And they utilize the latest technology. So grateful to have found them. " "No one likes going to the dentist but with Dr. Kovalchuk and his team we know we're in skillful, caring hands. I'd give six stars if I could!" "First visit and I was impressed. Friendly staff, nice view from the chair, good music, no judgement on the lack of daily flossing, no attempted upsale (Invisalign etc)..."
"I would recommend Dr. Kovalchuk to anyone needing dental services of any kind. Thank you for taking care of my needs, you are my dentist for life!"